Our SMART Board cost exactly $5,099.00. Actually, we paid $5,545 when you add 8.75% for New York State and Erie County sales tax. This includes the board (model SBX880i4), projector (model UF65), speakers, cables, wall mounting plate, delivery, and installation. Why I am I telling you this? Because it's a challenge to find SMART Board prices on the web. I tried to Google the price of a SMART Board before we made this purchase and I couldn't find a site with simple, realistic, up-to-date prices. SMART's site forwards you to a sales representative contact form. Blogs and websites seldom mention prices. My social media friends on Twitter and Facebook couldn't give me an answer either. Even school administrators I talked to didn't know exactly what they cost. Please keep in mind, we're a business and we were charged the corporate price. 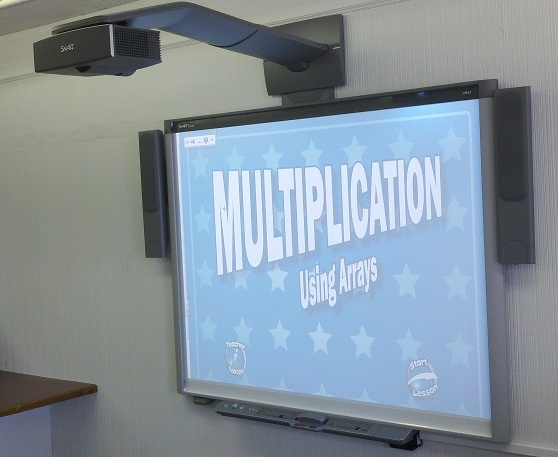 I have a feeling school prices are much lower because they often buy SMART Boards in larger quantities. (The salesman I dealt with seemed less than enthusiastic to answer my e-mails and sell me a board. I think he had bigger and more important clients to deal with in schools.) Of course, prices will also vary depending on the model and options you choose. We were quoted for two different sizes. There are standard (77-inch, 4:3 aspect ration) and wide-screen (87-inch16:10 aspect ration) versions available. We went for the standard, since that's what most schools in the area seem to have. We learned that new SMART Boards are sold only through authorized dealers. There is only one dealer in our area, so there wasn't really any way to shop around. There are many models of SMART Boards. I'm sure many are much more expensive than ours and some are probably cheaper than ours. We did not purchase SMART Response units (SRS, or 'Clickers') because they were ridiculously expensive. According to our quote, it would have cost $2,520 for a set with 32 remotes, or $1,985 for a set with 24. While we would like to develop SMART Response content on our site, it's not something we can afford to do at this time. There are ways to save money, if your budget is tight. Our board has the attached overhead projector made by SMART. I've seen several schools use less-expensive projectors made by other companies. These are usually mounted on the ceiling. Since we rent our office space, we didn't want to cut holes in the ceiling and lose our security deposit. The attached projector also made wiring easier. The speakers are optional - we paid $289.00. While you can use computer speakers, the SMART speakers are large and powerful - perfect for a large classroom. Could we have installed it ourselves? Probably. However, I was afraid to try because I didn't want to ruin my $5,000 board and void the warranty because I hung it on the wall incorrectly. However, I watched the installers do it and it didn't seem that complicated. The installation cost was $500. So, in the end, $5,099 is the price of a brand new, complete SMART Board in 2012. It was a big expense for a very small company like ours, however it is an investment that turned out to be well worth the money. We're having fun using it every day in our office, and we'll continue to use it to create the best SMART Board Notebook content on the Web. Written and posted September 7, 2012. Minor corrections and updates on January 18, 2013.